Facilities consist of 800 m of reinforced concrete quay, the center section of which is fitted with 6 handy dockside cranes 2×45 ton (29 m reach),1×27 and 3×12,5 ton SWL. There are also 4 other earlier generation cranes of 3 ton SWL on the other sections of the quay, all in disuse. Also included in the port equipment is a 45 ton mobile crane and one 45 ton reachstacker for container handling. There are 3 warehouses, each of 1500 sqm covered area and an open storage area, partly paved, of about 7500 sqm for containers, plus additional storage space elsewhere. The private firm AOT S.A. operates at the quay two grain silos of 1.500 tons each and one 10.000 ton grain cell (former 2 ware houses) with one conveyor belt, loading rate 400 TPH, planning to install two more in the near future. 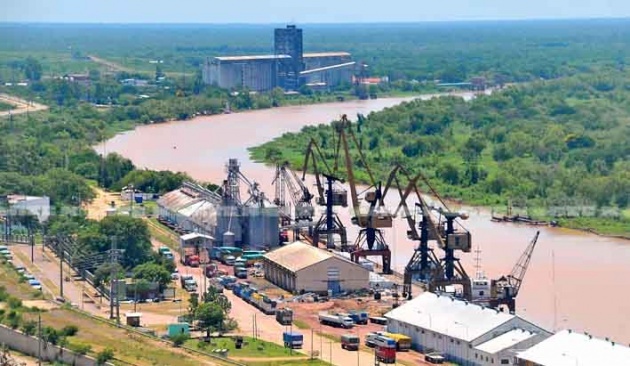 Port Administration operates 1 conveyor belt of 300 ton/h load rate ; plans to install 6.000 ton grain silos. There is a grain elevator situated about 3 km north of the port which has its own berthing site capable of accommodating two barges on dolphins. This elevator is operated by CoLoNo S.A. The elevator has a capacity of 105.000 ton and is fitted with 2 conveyor belts, each capable of loading barges at the rate of 500 TPH. 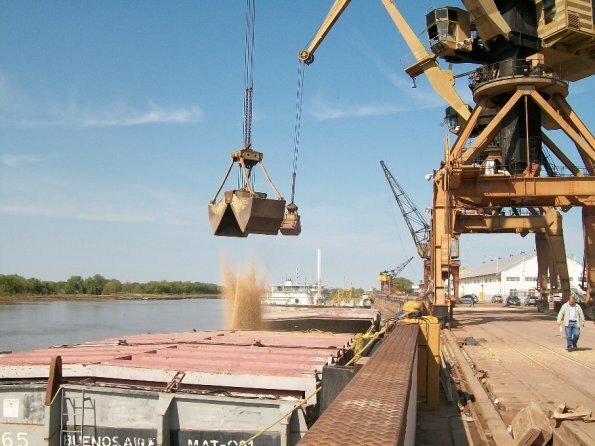 Barges and small domestic tankers, move timber, charcoal, soybean, cotton, tannin, honey, sand, home trade oil, including some TEUS to Buenos Aires and Montevideo. 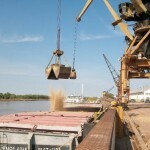 During 2011, cargo movement was about 500.000 tons. 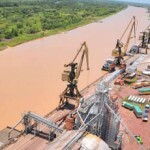 Normal drafts are arround 5,0 m (16′) ; early 2010, dredging works has begun to ensure both 3,50 m (11′) draft and 80 m width all along the Barranqueras River. It is worthy of note that the closing of the sluice gates at the Yacyretá dam can produce a temporary drop in the river level of 20 or 30 cm three or four days later. With regard to barge movement at the port, barge convoys tie up to the bank on the opposite side of the creek and are ferried across one or two at a time. At Puerto Vilela (Km 1196), A.C.A. 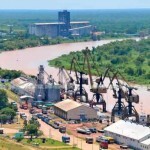 operates 84.800 tons silos, loading barges bound to carry grain cargo to their terminal at San Lorenzo. Cargill also operates 3 grain silos, total 170.000 tons, loading barges bound downriver. Shell and YPF operates two small wharfs for coasters, located at Km 1198. Fresh water & electric power available. Fire fighting system fitted in quays. There is a 20.000 sqm area (partly paved) for bulk cargo and containers.